This allows you to change the station tracks of the train station building you currently have selected from the menu for plopping. Stations which have been plopped previously will not change their tracks, so it's possible to plop the same station multiple times with different station tracks. If some tracks can't be replaced, that means they are either normal tracks (not station tracks) or some new or obscure type of station track which is not detected by the mod. In this case it's possible to use Move It while holding Alt, or something like touch this to move/delete/upgrade these tracks, but there is a risk of breaking the paths of the station. There are no specific cargo tracks, so it's possible to use regular station tracks on any cargo station, but a side effect of that is the ability to place passenger train stops on them. It also allows you to choose railway props used on the tracks, such as catenaries, buffers, signals, and crossing barriers. You are not forced to use an entire style, so you can mix catenaries from one style and buffers from another etc. The prop selection UI can be opened by pressing SHIFT + ALT + P.
Makes overhead wires 3.5x thinner, to match their real life dimensions. There is a basic set of props, which are used on the entire base set of tracks and also 3rd party tracks. They include things like the fishplate, tunnel darkener, fence beams, and some concrete boxes which match elevated and tunnel versions of the tracks. These include single normal catenary, single end-catenary, single tunnel catenary, double normal catenary, double end-catenary, double tunnel catenary, right signal, left signal, short barrier, medium barrier, long barrier, very long barrier, and buffer. On release, a pack of Swiss style railway props is available, which must be selected in the Railway Replacer by pressing SHIFT + ALT + P.
In the future there may be other full or partial styles by any creator. The props may also be plopped manually, and some packs may contain more props in addition to the ones you can select in Railway Replacer. On release, three sets of tracks are available: Pavement Surface & Concrete Sleepers, Gravel Surface & Concrete Sleepers, Gravel Surface & Wooden Sleepers, all available in wired and wireless versions. Elevated tracks are very bare, borderless, pillarless, which are intended for custom elevated railyards or more complex custom builds. Bridge is a generic concrete elevated track with pillars, borders, fences. Slope(tunnel entrance) is intended to be completely flat(no elevation change) and it's recommended to shorten it using move it. Tunnel works like any tunnel, but with visible interiors which get dark very quickly. Every pack also contains a set of station tracks. In addition to the base set of tracks, there are also different elevated and bridge assets to choose from. They are usually nodeless, therefore not intended for intersections. Includes wire-only networks and decorative borders for use on the bare elevated tracks. The initial releases (and hopefully future) of Railway have a consistent thumbnail style. The tracks, bridges and props are mostly very highly detailed, so you can think of your railyard as a huge very highly detailed building with highly detailed props on top of it. All Railway networks require Network Tiling. The Swiss barriers require PropRotating Params. Pillars show duplicate asset message, this is normal, because multiple tracks in the same pack use the same pillar, and CO's implementation bundles pillars in the network. LODs for all or some networks sometimes break - might have something to do with broken LOD texture atlas or incorrect uv remapping to the atlas. Not related to or caused by railway in particular, but might be related to having a lot of custom network assets. Note down the names of the tracks which are not found. and place them in the local assets folder, then unsub the workshop versions, then load the save. but change the tracks in the list to the ones which were not found for you, each track must be listed in the script twice - once with a 0 in the end and another time with 1 in the end. This script will move the camera to a track, you must delete or upgrade it to vanilla or some other safe track. Keep rerunning the script until it reports "none found" then save the game. Then you can remove the local pre-update tracks, and sub to the workshop versions again, then load your save and put the tracks you actually want back where you deleted/upgraded them before. Catenary Replacer is not relevant to Railway in any way, it doesn't affect Railway tracks. SingleTrainTrackAI has been updated to support these tracks. PropItUp may have a similar hotkey to the Railway prop UI hotkey, so both may pop up. If you have MOM, for train stations which include metro tracks, both UI may pop up. REV0 for traveling Switzerland to collect references, providing links to real railway documentation and measurements, testing, creating bridges for initial release. Simon Royer for developing the mod, and Egi for stepping in to help finish it. Testers: REV0, Johnny, leaderofthemonkeys, SimNationJan, Tim The Terrible. Station track and prop replacement. Developed by Simon Royer with help from Egi. Wireless tracks with concrete sleepers on pavement surface. Wired tracks with concrete sleepers on pavement surface. Wireless tracks with concrete sleepers on gravel surface. Wired tracks with concrete sleepers on gravel surface. Wireless tracks with wooden sleepers on gravel surface. Wired tracks with wooden sleepers on gravel surface. Wireless generic elevated tracks with concrete sleepers on gravel surface. Wired generic elevated tracks with concrete sleepers on gravel surface. Wireless green elevated tracks with concrete sleepers on gravel surface. Wired green elevated tracks with concrete sleepers on gravel surface. Wireless generic truss bridge tracks with concrete sleepers on gravel surface. Wired generic truss bridge tracks with concrete sleepers on gravel surface. Wireless old truss bridge tracks with wooden sleepers on gravel surface. Wired old truss bridge tracks with wooden sleepers on gravel surface. Decorative wire and elevated border networks. Basic set of props used for all Railway releases. Loads custom tiling values for network segment and node textures. The mod is required for people who want to use networks which depend on this mod. Catenaries - Railway Swiss Style Props. Also includes special catenaries and a prop pack to build your own. Signals - Railway Swiss Style Props. Barriers - Railway Swiss Style Props. Buffer - Railway Swiss Style Props. Decorative lights to go along with Railway Swiss Style Props. Fictional Pontepedra Bridge created by Armesto. Fictional Pontepedra Elevated created by Armesto. Mod to avoid train collisions on single tracks 2 ways from BloodyPenguin mod One-Way Train Tracks. How does this mod works? Feel free to use in your mods as a required item. Bare rail network to be used in certain rail facilities where access to undercarriage is needed or structure has its own supports. Having a couple of issues I can't find any solutions for: 1. The UI for replacing station tracks doesn't pop up when plopping any stations, but the prop UI functions fine. 2. 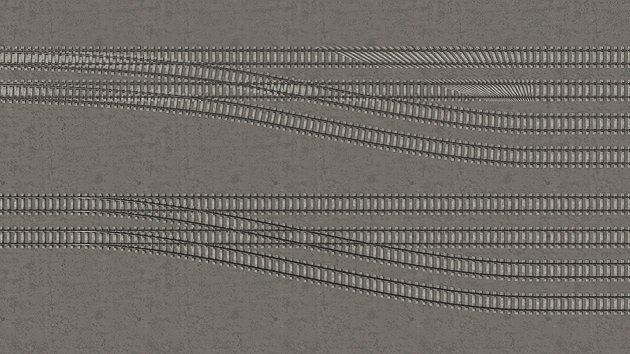 When I replace vanilla tracks on the map with these it seems all rail traffic coming and going through the map stops and when I lay track in the map editor, there is no green arrow indicating an outside connection. Is there a known mod compatibility problem that could cause this, or am I just doing something wrong? I really wish there was a set of US railroad style props. I really want to be able to replace the default crossing lights and gates with US ones, but I don't have any 3D modeling skill whatsoever. @Sir Ludicrous thanks for the tip. I actually don't think I have those stations but I do have a lot of rail stations and a different modular station pack. I'm just avoiding using move it with rail stations for now because my game takes about 10 minutes to load so I don't feel like wasting all the time troubleshooting lol. Also the SHIFT + ALT + P menu for catenaries does not work for me at all. i already have installed the mod to remove them, but no luck. I am using some of your tracks as well as the swiss tracks created by ron_fu-ta. His catenarys are more filigree and I would like to use them on your tracks, so I wonder what would be the way to implement his catenary pack as a separate choosable style into your pack system. Do u happen to experience these crashes with the modular japanese style stations by konfox0527? If yes, then its not this mods fault. konfox´s stations do crash when u use move it, its a known issue and not fixed yet. When using move it to move a station placed down with these rails, it causes the game to freeze and crash. Anyone else experience this? Another question: can i somehow prevent catenary poles to be spawned between the nodes? Railway: Germany is planned, I'm waiting reference materials about catenaries from someone who's in rail business in Germany.